Divisions are ruining college football, and there’s nothing we can do about it. College football divisions dilute traditional rivalries and reward weak schedules. And there’s nothing we can do about it. 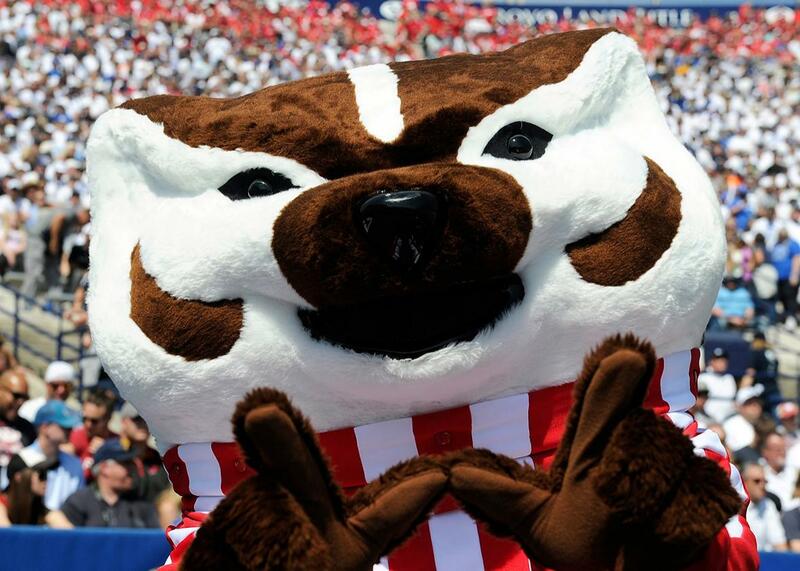 Wisconsin Badgers mascot Bucky Badger performs during a game between the Badgers and the BYU Cougars on Sept. 16 in Provo, Utah. Wisconsin’s game against Michigan on Saturday is the biggest college football match-up of the week and of the Badgers’ season to date. It’s the fifth-ranked, 10-0, national title contender’s chance to demonstrate its bona fides to the country and the College Football Playoff committee by defeating a blue-blood program, a Jim Harbaugh-led Michigan squad that … [checks clipboard] … actually, hang on a minute. It turns out that Michigan has not itself beaten a team with a winning record and got blown out by approximately 400 points in its only game against an elite competitor this year. Michigan, the most formidable of the 12 regular-season opponents faced by an ostensible title contender, is an above-average Big Ten team, but seemingly not much more than that; it will probably end up in a second-tier bowl game sponsored by an appetizer-oriented restaurant chain. But if the Badgers beat the Wolverines and defeat mediocre Minnesota the following weekend, they will enter the Big Ten title game, likely against Ohio State, with an undefeated record despite not having played anyone who’s any good. If Ohio State beats Wisconsin, there’s no guarantee it will make the playoff; having faced a tough schedule, OSU has a number of impressive wins but also two losses. But if Wisconsin wins, it will almost certainly be chosen for the four-team playoff despite playing a schedule that’s bereft of decent competition. That’s silly! And the division-ization of college football is to blame. The reason Wisconsin hasn’t played anyone good this year is that it’s a member of something called the “Big Ten West.” The Big Ten West, like the Big Ten East, has seven teams, meaning the Big Ten as a whole is made up of 14 universities. (Please trust that you are not the first person to recognize that this is deeply stupid.) The West is currently weaker than the East because of both random fluctuation (Michigan State is on an upswing while Nebraska is cratering) and geographical circumstance (the traditional powerhouse East teams in Michigan, Ohio, and Pennsylvania have denser local populations to draw talent from than West squads like Wisconsin, Iowa, and Minnesota). Each Big Ten team plays the other six teams in its division every year, but only three of the seven teams from the opposite division. This year, that arrangement has allowed the Badgers to dodge tough matchups against the Big Ten’s three highest-ranked non-Wisconsin teams: No. 9 Ohio State, No. 10 Penn State, and No. 17 Michigan State. Meanwhile, they’ve played all five Big Ten teams that will go into this weekend with conference records of 2-5 or worse. Divisional imbalance isn’t just a Big Ten thing, either: The SEC East has been so weak in recent years that Florida won it in both 2015 and 2016 despite its program being in such a state of dysfunction that its coach just quit mid-season after a controversy involving possibly made-up death threats. Why, then, do we have divisions? What was wrong with the Big Ten having 10 teams that all (mostly) played each other every year? For that you can blame the conference “realignment” which began in 2010—a misleading term, given that its primary effect wasn’t just shuffling schools around, but rather shifting schools from smaller conferences into larger ones to expand the so-called “Power 5” (the Big Ten, SEC, ACC, Big 12, and Pac-12). “Conference bloat” would probably be a more accurate description. Three of those conferences now have 14 members, while the erstwhile Pac-10 became the Pac-12. (As recently as the late 1970s, it was the Pac-8.) With that many teams, a true round-robin schedule isn’t feasible. The solution: Put the teams into two divisions whose winners face off in a post-season title game. The division-ization of college football—or, as I call it, the story of How Rutgers Happens to Good People—has fundamentally changed what used to be a regional sport. Before the Bowl Championship Series and now the four-team playoff, we could very easily identify the best teams in the South and the Midwest and the Far West, because they all played each other. It was much more difficult to figure out the best team in the country. Now, it’s somehow easier to identify the best team in the country—it’s hard to fake your way through a four-team playoff—than it is to identify the best team in each region. We have no idea if Wisconsin is the best team in the Big Ten, because Wisconsin hasn’t played any of the other good teams in the Big Ten. This is an odd state of affairs. But not every expansion move was ingenious, brand-wise. In 2012, the Big Ten made the not-obviously-lucrative choice to add football non-powerhouses Maryland and Rutgers, seemingly on the theory that, hey, everyone else has 14 teams, so why not keep up while expanding the footprint of the Big Ten Network into two big media markets on the East Coast? And that’s how you end up with, say, Ohio State obliterating Rutgers—Rutgers! It’s in New Jersey!—every year and only occasionally clashing on the frozen tundra of the Midwest with the beefy young men of Wisconsin, as God intended. Ohio State first played Wisconsin in 1913; it first played Rutgers 101 years later. On the television front: While the Big Ten Network did end up getting carried in New York, that’s only because sports channels are still being subsidized by non-sports-viewers who pay for one-size-fits all cable packages, an inefficient, pre-cord-cutting model for selling TV content that’s on its way out. Respect and 25 cents will buy you a phone call, though, if you have two losses and you’re comparing your playoff chances to those of an undefeated Big Ten champ. Enough other teams that are probably about as good as Wisconsin have already lost twice (the friendly fire has been especially rough in the Pac-12) that the Badgers will almost certainly make the playoff if they win the Big Ten title game, a made-for-TV affair played in Indianapolis’ NFL stadium that’s typically low on atmosphere and light on ticket sales. But you know what? I’ll probably watch the Big Ten title game, as contrived as it is, just like I’ve watched all or part of three Rutgers games this year—I’m a junkie with a college football problem and I can’t help myself. People like me make realignment profitable, which is why big conferences and weird unbalanced divisions are here to stay. If we want to complain about who Wisconsin has played lo these fall Saturdays, we first need to examine our own Saturday behavior.